There was a time when dunking your donuts into a cup of coffee was the way that you were supposed to eat a donut. It was the way that people were shown eating donuts on TV and depicted in the Sunday comics, and if you went down to the neighborhood diner, you were sure to see people dunking donuts, too. Heck, a whole donut chain is named after the idea of dunking donuts into coffee! I almost never actually see people eating donuts this way these days, even though most coffee shops stock donuts. 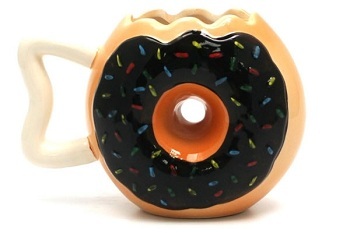 I don’t dunk, but I do like the idea of a dunked donut, and that is exactly why I like this Donut Mug. It’s shaped like a donut – Simpson’s style, with sprinkles – and you can pour your coffee right into the “bite” at the top. It is just about cute enough to get me to try dunking donuts into my coffee – although I think I might have to start with a matching donut when I get around to giving it a try.